You need a friend who is willing to think outside-the-box and explore possibilities and dreams with you. You also deeply crave authenticity and honesty – you can handle constructive criticism if it’s given with compassion. You hate feeling like anyone’s playing a part to be your friend or not being real with you. Most of all, you want someone who can let go of what’s practical and normal and explore outlandish ideas, creative pursuits, and endless theoretical possibilities with you. You hate being “bound” by someone else’s worldview – you want to throw off the shackles of the mundane and go on a mental adventure with someone. You need a friend who’s willing to verbally spar with you about complex topics and ideas. You want to spend time with someone who’s mentally quick, open-minded, and analytical. You can be assertive, skeptical, and questioning, so you need someone with a relatively thick skin who doesn’t mind calling you out if you’re wrong or admitting when they’re wrong. You see the world as full of possibilities and interesting challenges, and you want a “partner in crime” who can push boundaries with you, explore new concepts and theories, and come up with exciting life-changing ventures. You value relationships that are based on depth, honesty, connection, and personal growth. You want a friend who’s willing to be 100% authentic with you and discuss anything without feeling restricted by outside rules or “propriety”. As an idealist, you crave friends who want to make a difference in the world or who strive to live according to their ethics. You admire people who are looking to grow personally and always improve, always imagine something better. You also seek creativity in a friendship – you get a thrill from creatively pursuing random paths at will, whether it means dissecting the meaning of a song or painting together. You value relationships that are based on authenticity, curiosity, and mutual freedom and respect. You enjoy a friend who can give you your space, yet come together for a meeting of the minds, a friendly debate, or an exploration of a theoretical concept. You like it when people are direct and precise with you, when they accept you for who you are and respect you enough to tell you the truth and listen to your truth. You enjoy discussing abstractions and theories and figuring out how things work or solving puzzles with others. You want a friend who will invite you to get-togethers and events, but not “guilt trip” you if you need some time alone. You crave deep, authentic, intense relationships where there is shared warmth and mutual empathy. You desire a friend who strives to be their best self and is always looking for opportunities to push themselves to reach their potential. You also need someone who will put effort into the relationship – it can frustrate you to always be the one to “make the first move”, pick up the phone, or arrange an outing. You can start to feel like maybe you aren’t wanted if you have to consistently do all the work. A relationship with mutual empathy, sharing, vision, and respect is essential. You look for a friendship that is steeped in honesty, energy, and intellectual curiosity. You always love to learn and challenge yourself, so you desire a friend who has this same driving motivation. You want someone who is ready to question the norms, set big goals and work hard to achieve them. You want someone who you can debate theories, concepts, and “taboo” concepts like religion and politics without getting squirmy. You appreciate thoughtful, compassionate people – but they have to be able to handle your directness and blunt delivery. Things that turn you off in a friendship are wishy-washy behavior, flattery, laziness, or lack of ambition. You crave a friendship that is built on a foundation of authenticity, compassion, and vision. You hate drama and so people who attract or seek drama will quickly turn you off. You want a friend who can share their heart with you, and who is willing to listen to your deepest feelings as well. You want someone with a creative mind – someone who is willing to question things, see beyond the confines of the material world, and create big dreams and goals. Empathy is valued in a friend – sometimes you can get stuck being the listener all the time, and you need someone who will also listen to you. Lastly, you want a friend who understands when you need bouts of alone time and solitude to recharge. You desire a friendship that is filled with deep, intellectual conversation, adventure, and mutual respect. You need a lot of personal space and don’t want someone who’s emotionally needy or overwhelming. As an independent individual you want a friend who also has their own goals and interests and doesn’t need constant stimulation from you. You like to dissect theories with your friends, to pull ideas apart and figure out which ones hold up to scrutiny. You like to let loose sometimes and do something recreational or spend time outdoors. You enjoy people who are creative, questioning, and deeply authentic. You crave a friendship that is filled with authenticity, adventure, and mutual empathy. You see the beauty in the simplest moments of life – whether it’s the smell of flowers on a morning breeze or the release of a new song by your favorite band. You want a friend who will appreciate these moments with you, look for them with you, someone who will give affection and affirmation. You appreciate a friend who can listen well, laugh at themselves (and you), and be there for you on the good and bad days. Things you avoid in a friendship are people who are arrogant, drama-seekers, or people who lack compassion. You desire a friendship with someone who has a strong sense of adventure and fun. You like to be active and physically engaged with the world around you, so somebody who can join you for recreation, gaming, or rich sensory experiences is ideal. You also appreciate a sense of humor in a friend – people who take themselves too seriously or can only see the dark side of life drain you. For you, friendship is about challenging yourselves, exploring the world, regular immersion in thrilling or tactical experiences (sports, concerts, recreation). Friendship is about being there in a hands-on way when times are tough. You show up for people during a crisis, and you’re skilled at providing practical support and solutions. You appreciate a friend who can do the same for you. You crave a friendship that is built on a foundation of authenticity, compassion, and fun. You need regular alone time, so a friend who needs constant stimulation can be difficult for you to deal with. You want a friend who takes the time to get to know you, and who understands that you’re not an open book right away. You appreciate someone who will share their heart with you, be honest with you, and find simple pleasures to enjoy with you. You enjoy a friend who can get creative with you – whether that means writing a song together or even coloring in coloring books. Quiet moments of shared empathy and support help you to feel cared about and understood. You desire a friendship based on trust, respect, and shared experiences. You have a strong sense of fun and enjoy finding exhilarating experiences to enjoy with others. You enjoy challenging yourself and tend to appreciate friends who are up for recreational pursuits, games, or hands-on projects. You like toying with ideas, but you want those ideas to have a practical application. You can get frustrated with friends who theorize to no real purpose. You also get frustrated with people who need constant hand-holding or emotional support. As a highly independent individual you need regular alone time to recharge and don’t want to be made to feel guilty for that. You have a fondness for people who know how to laugh at themselves, challenge themselves, or engage in some friendly mental sparring. You crave a friendship that is full of intimacy, connection, and trust. You want to have open and frequent communication and you appreciate someone who shows up on time, follows through on plans, and doesn’t rely on you to be the “scheduler” for every get-together. Because your type tends to be more outgoing, some people feel that they don’t need to put any work into the conversation. You don’t want a one-sided relationship; you care about two-way communication, mutual support and empathy. You like working on projects with people, planning for the future, and discussing relationships, feelings, and favorite experiences. You desire a friendship that is built on mutual trust, experiences, and support. You enjoy friends who are motivated, ambitious, and down-to-earth. People who take themselves too seriously or are emotionally reactive and needy can be difficult for you to be around. You appreciate working alongside people, doing projects together, and working towards shared goals. You tend to enjoy a lively debate and brainstorming with a friend who’s intelligent and full of new ideas. They just have to be willing to logically back up their ideas and theories and handle your directness. Loyalty, honesty, and shared values are the foundation of a good relationship to you. You crave a friendship that is peaceful, harmonious, and full of shared trust and empathy. You want someone who can geek out over your favorite hobbies and interests and find humor in everyday situations. You want someone who you can really bare your soul with, who won’t judge you or jump in with a bunch of unneeded advice. Loyalty is important to you, and you want a friend who can prove that through being there in the hard times and not just the good times. Being on time, not speaking badly about people behind their backs, not causing drama – all these things inspire trust in you. You desire friendship with someone who is down-to-earth, intellectually curious, and responsible. You have a hard time with fair-weather friends or people who don’t show up when they say they will. You put a lot of thought into everything you say and do and you appreciate people who are attentive and conscientious in the same way. Once you’ve committed to a friendship you are usually very loyal, and you crave the same kind of loyalty in a friend. You’d rather have one authentic lifelong friend than a handful of shallow relationships. Did you enjoy this article? 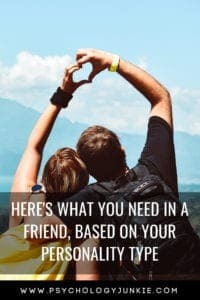 Do you have any tips for being friends with someone of your type? Let us know in the comments! This is spot on! I have a feeling I will be looking back at this article whenever I find out the type of someone I know. Knowing what the other person is hoping for in a friendship is so helpful. Thank you!